This is written in response to several queries on changing labels to published posts. People are not aware of the simple method of changing, removing or adding labels to published posts. This short article is a reminder of an easy-to-use feature that is already available in our Blogger platform. The situation is that when we start writing posts, we assign different words as labels to our posts. As we had mentioned in Technorati Tags in Blogger Posts, such labels are tagged by Technorati and other third party sites and your posts appear in their tag search results. It is therefore good to assign the relevant keywords or labels that can best describe your posts. Over time, after publishing several posts, you may realize that some of the labels are not appropriate, or you may simply want to streamline the words to make them consistent. 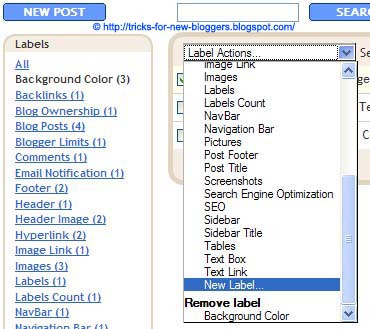 Instead of editing each individual post, you can click the Manage Posts link on the Blogger Dashboard or go to Posting -> Edit Posts. Click the label on the left panel and you will see a list of all the posts containing that label. Against these posts are check-boxes. Click all the posts that you want to change. The dropdown menu titled “Label Actions” allows you to insert labels or create “New Label” for the posts that you have ticked. Once applied, the new labels will be added to the posts. The menu option also includes “Remove Label”. To change the published post label to something else, remove the existing label and add a new label to the posts. Refresh the blog to view the change in the Post Labels. Thanks for this great post. Even though the feature is right there under my nose. I did not see it. But as usual, I knew where to run to. The blog of my tutor. Have a wonderful time and I wish you a prosperous 2008. Cheers. I'm trying to make my post labels to become the meta keyword for each individual post. Would you happen to know the script to do this? Right now all my pages are having the same meta keyword. Appreciate your feedback. I'm trying to make my Blogger's individual post label as the keyword tag for that post. Is there an automatic script that can help do that? I managed to do it for the description tag but got stuck at the label keyword. Appreciate your feedback.